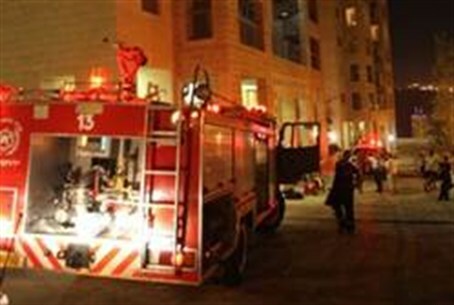 Nineteen people were injured Saturday night in a fire at a Bnei Brak nursing home. A fire broke out Saturday night at a nursing home on Rechov Hashlosha in Bnei Brak. Nineteen people were injured. Three elderly residents of the home were in serious condition due to injuries from smoke inhalation. The three were taken to local hospitals, where they are unconscious and on respirators. Another seven people suffered moderate injuries. The rest were lightly hurt, mostly by smoke inhalation. During the fire part of a ceiling collapsed. Firefighters have been searching the building to ensure that no residents were trapped in the area. Earlier in the day a 26-year-old man from Beit Zarzir was badly injured when a fire broke out in his bedroom. The man was taken to Haemek Hospital in Afula, and from there to Rambam Hospital in Haifa, where he is being treated for third-degree burns.